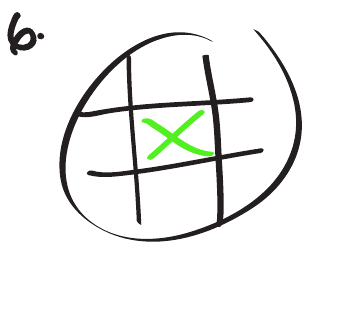 The Game: Tic Tac Toe. A new twist on the classic. Get 3 in a row to win. Lose by letting the other player do so, or by running out of time. 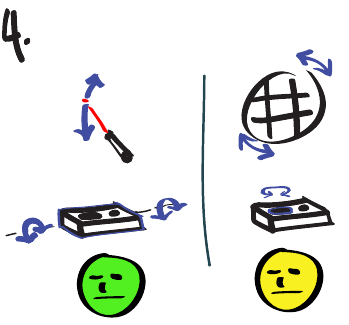 Player can use his/her controller to aim a laser gun to hit targets, opponent can use his/her controller to rotate the backboard and make targeting more difficult. Step 1: Two players shall approach the game. 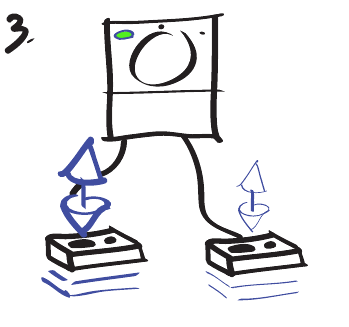 Step 3: Each player shall shake their controllers with as much vigor as they can muster. For discussion, let the green-headed player win this stage of the game. 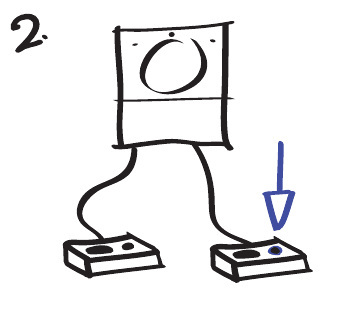 Step 4: The green-headed player aims the laser by tilting the controller up and down or left and right. 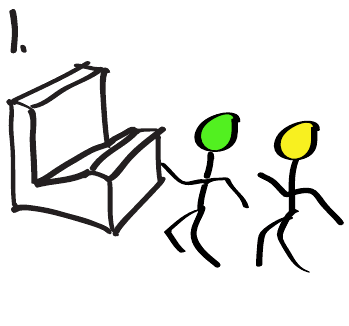 The yellow-headed play may spin the gameboard by twisting the knob on the controller. Step 6: The square will light up according to whomever selected it. 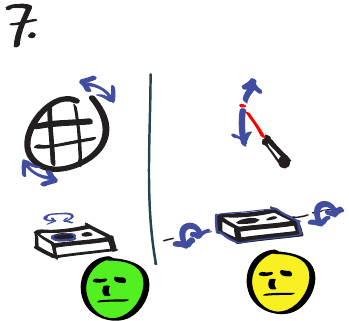 Step 7: After selecting his square, the green-headed play now controls the spinning gameboard, while the yellow-headed player gains control of the laser. 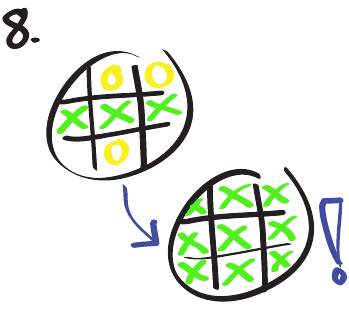 Step 8: Select 3 squares in a line to win. Each player is alloted 16 seconds over the entire game to aim the gun. If the timer expires, as shown by the lights on the side of the game, the lolligagging player will loose. Do not select a square that you have already claimed. If you do so, you will give that square over to your opponent. The MASOT demands continued interaction from the user to play the game. 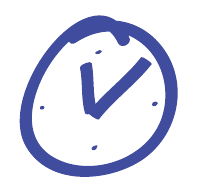 The average user takes 20-45 seconds to interact with the MASOT, after which it goes into a resting state. The vigor with which each player shakes the controller determines who aims first. If it is the player's turn to do so, tilting the controller aims the laser. If it is the player's turn to do so, twisting the knob rotates the gameboard. 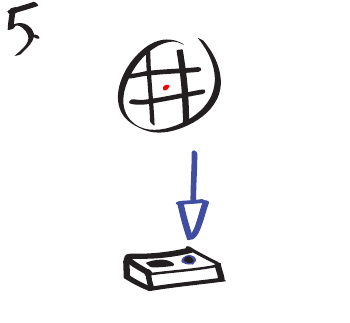 If it is the player's turn to do so, pressing the button selects a square. 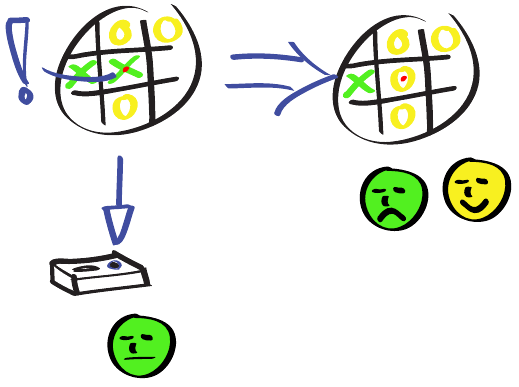 Depending on the ownership of the selected square, the game's scoring system reacts in 3 possible ways. the majority of squares, or who doesn't run out of time. The MASOT requires at large-scale motion from the user whens shaking & tilting the controllers. Depending on whose turn it is to aim the laser, button-pressing, tilting, and knob-twisting generate different outcomes. The two lines of lights on either side of the game display the remaining time. The MASOT features numerous lights, indicating when the game is active and dormant. Upon completing the game, the gameboard flashes the sign of the winner, queuing them to gloat. The MASOT is best enjoyed with a friend. The MASOT is adorned with a lovely set of pictograms, instructing potential players of the game's rules. This MASOT also satisfies all of the basic specifications, which are parphrased below. Our lovely team of 3 constructed this device. This MASOT features numerous parts that visibly move. The vast majority of the MASOT's components were constructed and assembled by us, not purchased whole. The game responds to more than the required 3 interactions. This MASOT inteprets 8 inputs (two controllers each with a 3-axis accelerometer, and voltage from a potentiometer) from the user as analog signals. Detection of IR light in parallel with the laser is done with non-contact sensing. Throughout the game, the MASOT provides tacticle feedback via the vibrating controllers. The MASOT requires only power to operate. The MASOT qualifies for free-shipping. This fine device was handbuilt, with a keen sentitivity to fine craftsmanship and not painting in the SPDL. While the circuitry does reside on a breadboard, it is secure enough to survive delicate handling. Circuit schematices were created and updated throughout the project.